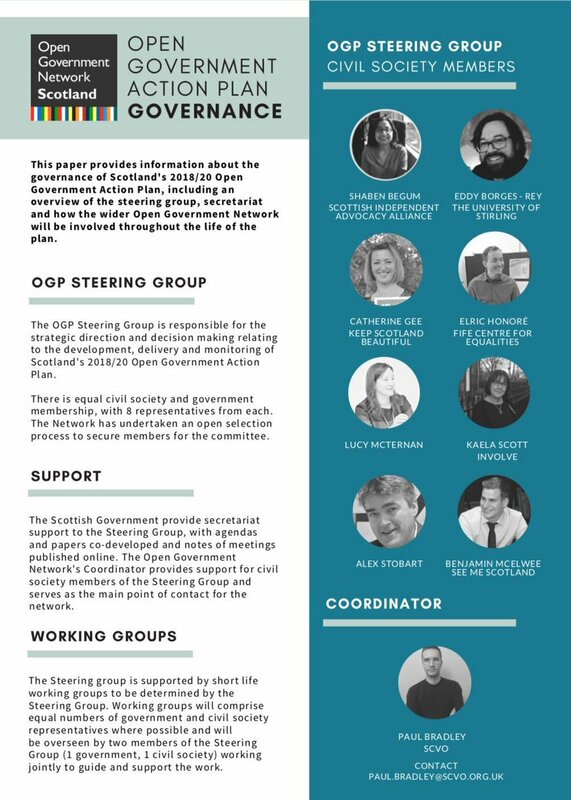 I’ve been a mostly-quiet member of the Open Government Network Scotland for about two years. I’ve not done much, just quietly supported the idea that if we have access to facts and ideas, we can make more informed, and hence better, decisions. However, in December I spent a weekend proofreading a late draft of the new Open Government Action Plan, so I was delighted to be invited to this morning’s launch of the finished document. As ever, this post is to consolidate and review my thinking and learning, as well as to share it. So errors and omissions in this account are mine. Here is the agenda for the day. My tweets, thoughts and write-up follow it. 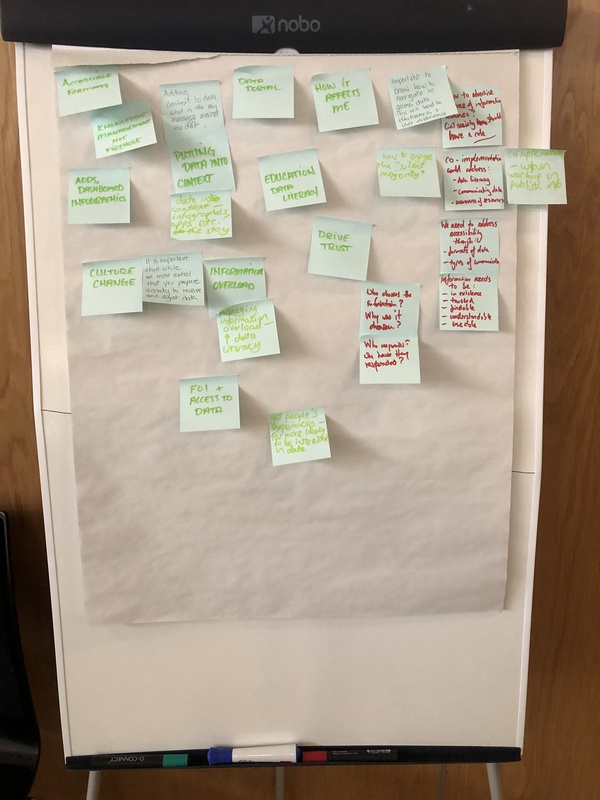 Group discussion questions: How do we work in partnership? MR talking about his current work as Cab Sec for Government Business and Constitutional Relations; talking about how #Brexit calls for #OpenGov, Thanks Lucy McTernan for leading the work. Thanks @COSLA for its work. MR is @Feorlean He says there is hard work to do, but @scotgov is committed to #OpenGov, which is a challenge to #populism, and believes in #OpenGov principles. URL for today’s livestream is on YouTube. Question: where will work of #OpenGovScot happen? @LucyMcTernan mentions her ‘bee in bonnet’ is financial transparency. If we know what’s happening with money, we can make better decisions. Hence maybe we need an online portal explaining Scottish Budget. @Feorlean says we are well on route. @Feorlean adds that there is input and output with financial transparency. That is, what do we **do** with the info. Massive parallel, for me, with #Informationliteracy. As @spartakan might point out, IL needs a ‘use’ step, which @CILIPinfo has in its new-ish definition. And thanks to @PaulMBradley for the full set of hashtags: #OpenGovScot #OpenGovScotLAUNCH #OpenGov. I will write up tweets as a blog post. So that was the extend of my live-tweeting. I’m usually much more prolific, but 9am starts don’t suit my erratic body-clock! There were so many people interested in discussing ‘participation and public involvement’ that they filled two big tables. In contrast, only a few wanted to discuss ‘transparency on Brexit’. Could that be because everyone is fairly sick of this subject? I know that the B-word is bad for my blood-pressure. Anyway, after some dithering, I joined the ‘financial transparency’ discussion. This interests me because my much better half is in the Scottish Exchequer (the part of the Scottish Government ‘responsible for the overall Scottish Budget including tax, spending and measuring performance, and for advice, support and systems on finance and procurement’. I’m also interested because there is no such thing as ‘the Government’s money’ – it all comes from individual people, and so I want us all to be able to check that it’s being spent appropriately. Feedback from the table discussions is on YouTube. I started by mentioning that any data needs to be findable. As an academic, I’m used to putting research data on my university’s repository so others can use it. However, repositories need to be searchable so people can either find the data they are looking for, or be sure that no relevant data exists, before gathering their own. So financial data-sets will need good meta-data to make it findable. I was also concerned that routes to data via local authority websites need to be standardised. A coursework from my MSc suggests that LA websites vary far too much, despite the then existence of the ‘Scottish Navigation List‘. Others commented that there is a need for agreement on how/in what formats data should be published. Then others will use the data as they wish. A Scottish Government procurement official noted that this division routinely publishes data, but is not sure whether both raw data and their interpretations and visualisations are wanted. Personally, I’m in favour of both: raw data so we can do things with it, and SG’s own interpretations for those who don’t have the time to do their own interpretations. (I realise now that the way data is ‘officially’ interpreted may reveal officialdom’s assumptions and mind-set. A former local authority official mentioned that organisations need to be able to find out who else is doing similar things with data. This should lead to some efficiency- and learning-savings. However, she has banged her head far too often agains local authority ‘silos’. Been there, done that, it hurts! It was agreed by our table that publishing financial data should be more than a tick-box exercise, and that governments cannot rely on predictions of how people might want to use data, because they cannot know a priori what people want. 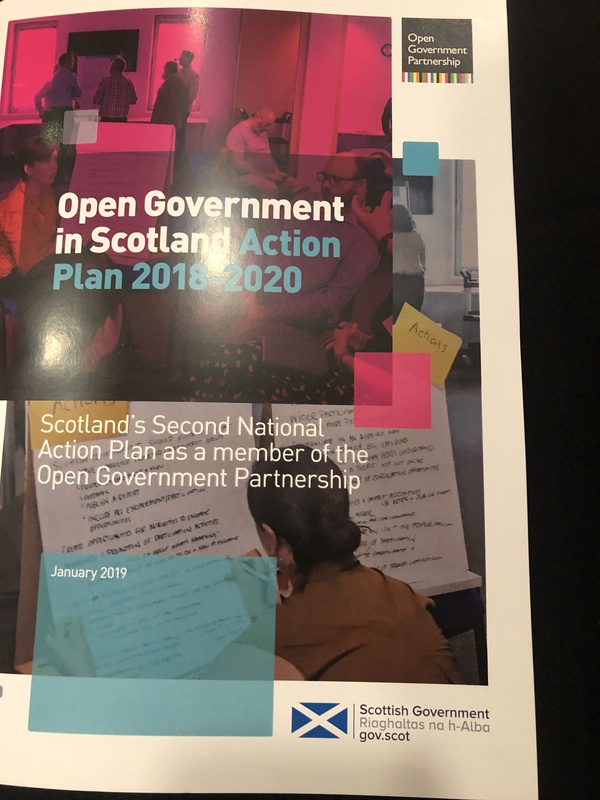 I was also somewhat concerned that while the Action Plan had financial transparency actions for the Scottish Government, and the support of COSLA, there were no apparent actions for local authorities, other public bodies or lower levels of Scotland’s democracy. There was a lot of discussion about ‘live’ versus ‘snapshot’ data. Of course, I want to be able to know how much has been spent on any topic so far this financial year – live data. But I also want to be able to compare this year with last year, both at financial year-ends and year-on-year at any point within the financial year. So I think we need snapshots too. In any case, a culture-shift towards publishing live data appears to be needed. 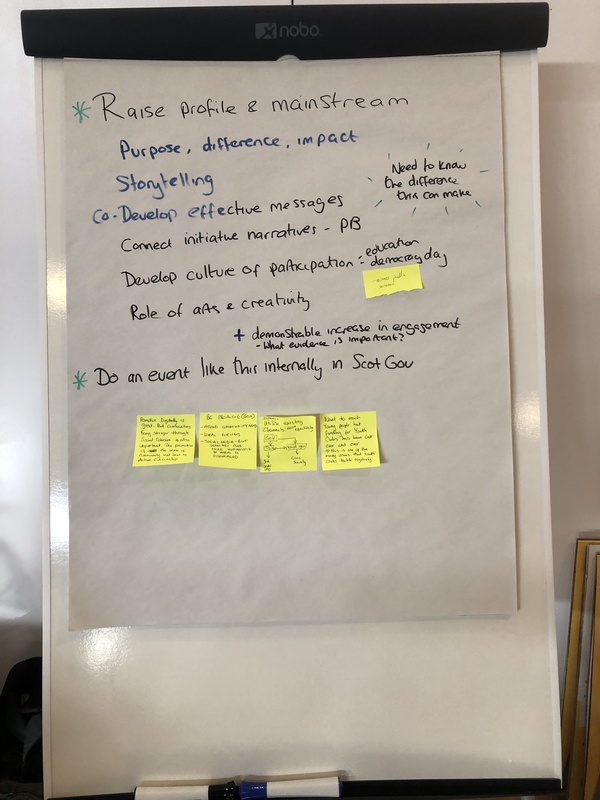 Talking of culture shifts, there was mention of three cultural barriers to publishing data: (1) fear of what people will do with data; (2) fear that data is incomplete (and hence not publishable); (3) fear of being held to account. However, it was noted that Glasgow has bucked this trend by joining the Open Government Partnership group of sub-national bodies. Then there was consideration of trust. It was suggested that because people don’t trust government, an intermediary should be set up. I think that this would be a complete waste of effort and resources. Firstly, because this intermediary would be set up at least partly by government, people who don’t trust the government won’t trust its creations. Instead, I think governments just need to crack on with publishing data. As they do so, and as respond positively to criticism, and as they are seen to do both of these things, so Schnackenberg and Tomlinson’s (2016) model suggests trust will be engendered. 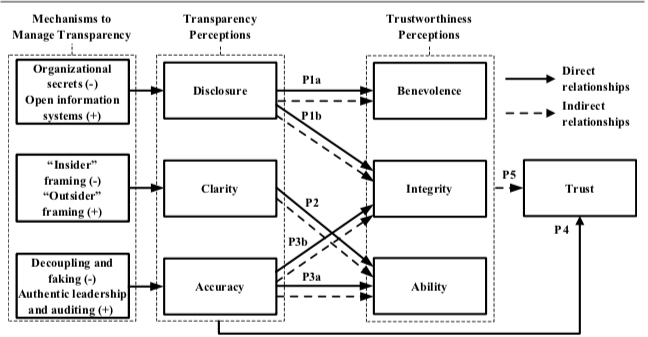 Schnackenberg and Tomlinson (2016) have stated that greater openness/transparency reinforces perceptions that information-providers are trustworthy, leading to more trust. They define transparency in terms of three dimensions: Disclosure is defined as the perception that relevant information is received in a timely manner. Clarity is defined as the perceived level of lucidity and comprehensibility of information received from a sender. Accuracy is defined as the perception that information is correct to the extent possible given the relationship between sender and receiver. Schnackenberg and Tomlinson quote Mayer and Davis (1999) who define trustworthiness perceptions in terms of three related dimensions. Ability refers to ‘the group of skills, competencies, and characteristics that enable a party to have influence within some specific domain’. Benevolence refers to ‘the extent to which a trustee is believed to want to do good to the trustor, aside from an egocentric profit motive’. Integrity refers to ‘the trustor’s perception that the trustee adheres to a set of principles that the trustor finds acceptable’. This photo had two consequences: (1) I asked if I could blog it, and was told ‘Of course! This is about open government.’ Doh! 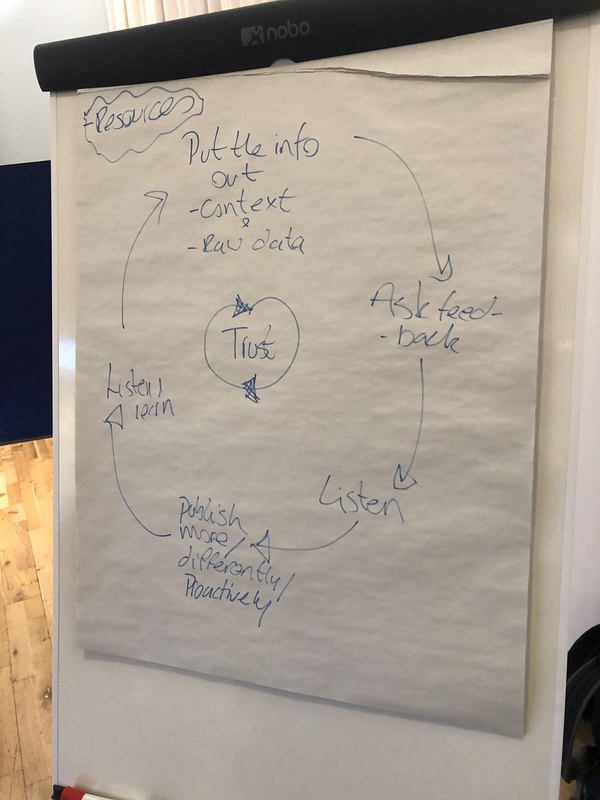 (2) I wonder whether Schnackenberg and Tomlinson’s model needs a feedback loop, perhaps from (a) trust by a first set of information-recipients to (b) a reputation with others for trustworthiness to (c) increased pressure for disclosure, clarity and accuracy. Alternatively, the feedback loop could include a ‘use’ step. If data is found to be useful, this would enhance an organisation’s reputation for trustworthiness . Another alternative is that a measure of usefulness could be added to the ‘transparency perceptions’ dimensions. Ah well, it’s not my model, and I’m currently in no position to research additions to it. But it is great to see academic concepts having connections to real-life issues. This is the first section of some very brief notes on other tables’ findings. My occasional comments are in [square brackets]. 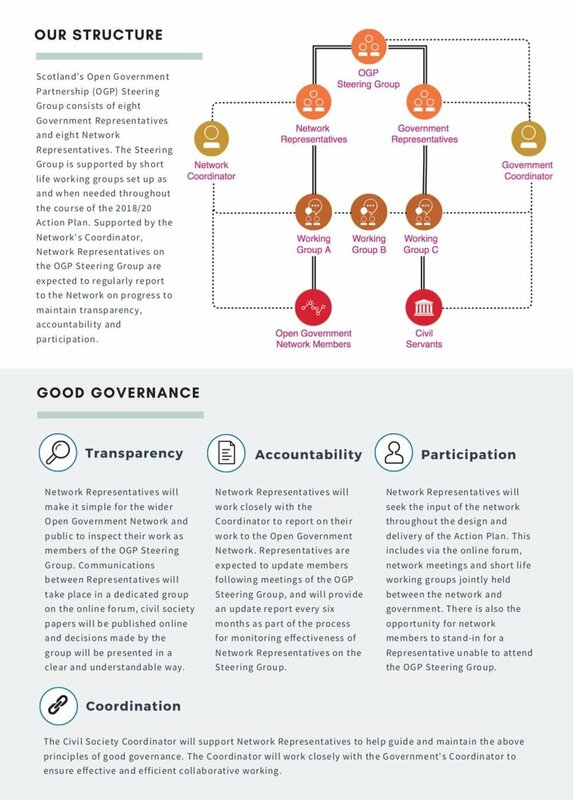 There is a need to understand and raise the profile of open government. It’s a long-term process, aimed at increasing participation in government. There is lack of awareness of what local government does. Stories may help here. There is a big role here for civil society. There is a role here for arts and creativity. CSOs can support spaces for engagement. Resources are needed to build capacity, especially so that ‘under-represented’ people become more involved. There is a need for feedback to show [and, I think, build] effectiveness. CSO-government relationships are becoming more collaborative. Accessible data-formats are needed, and that data should be set in context. CSOs should work with SG to visualise and interpret data. Data needs to be used in context. The current, somewhat paternalist, culture of government needs to change. Government should be open by default. FOI legislation has been useful. Data-sources need to acknowledge that there are different uses for data. Some of these uses may be personal. What would we do without post-it notes? There is a need for data-literacy. We need to think about how to open local government data. We need to think about how to create spaces for open, honest conversations. We need to think about what accountability really is. How can we map the ‘scrutiny world’? How can we bring in others, or [better] go out to communities? If the plain-english version of a publication says different things to that stated in the full-detail version, what does that say about the publisher or information-source? Not surprisingly, some despondency emerged from this discussion. This might have been because Brexit information is massively closed off. It was also suggested that this event was in a bubble of believers in open government and so we need to check reality. It was also suggested that there is a need to know how to tell what is real and what is fake news. Finally, this table noted that open government is important, for example, in the many trade negotiations the UK will soon conduct. Stephen Gallagher stated that we want to be bold and more transformational, and that the journey is important. He mentioned that the values of the national performance framework include compassion and kindness. [Now I know I live in the right place, if these are parts of national policy!] Living such values leads to accountability. However, despite [some] scepticism being healthy, Scotland has aspirations, and these will, ideally, lead to trust. The final question was ‘where do we go from here?’ That is, Scotland now has two years to fulfil the five commitments in the action plan. My suggestion is that while the Board will adroitly handle the day-today nitty-gritty, this group should meet every three to four months, partly because if I don’t have deadlines nothing gets done, partly to constructively scrutinise (and maybe criticise) but mostly to learn from each other and live the spirit of open-ness. So: thanks to the Scottish Government and the Scottish Open Government Network for organising this event and the chance to meet up with Demsoc friends, to Elric, Paul and Mike for interesting and challenging conversations, and to Doreen for pointing out I’d just not seen the vegan sandwiches. See y’all in April or May, and let’s get even more ambitious! Any mention of developing APIs through which data can be published? Although I get the impression that this discussion was mostly focussed around giving access to data in a way that’s readable by normal people, the power of APIs in that context is that third parties, outside government, may develop visualisation and aggregation tools to help make that happen. That is potentially scary, but a good example of openness. This approach seems to have had mixed success elsewhere – a quick search suggests that the US government have taken this approach for some time, while the UK government has deprioritised the development of APIs. No real mention of the nitty-gritty of how to publish information, except that raw data should be in CSV (or Excel) format. (I agree with this, having had to dissect too many PDFs.) The one techie at my table did utter ‘API’, but this didn’t receive any exploration. I wonder how many people at the event actually know what an API is. My knowledge is rusty, and my most recent qualification is in IT! Exposing the data itself, while avoiding undue interaction with the gubbins that holds the data, seems to be a good idea. However, might APIs limit what can be done with the data? For example, if the API doesn’t have methods for summing, averaging, giving last week’s data as well as this week’s, what can be done? Or am I misunderstanding, in that the API’s role is to say ‘here is the data in XYZ format. Now use **your** tools to do what you wish with data in XYZ format’? If so, then I’d support outside bodies using data to discover things from government data. Partly, it could bring new analyses to government data; partly it could do things which aren’t government’s current main concerns. By the way, I’m still facepalming about an event I went to earlier this week. A social scientist was talking about opening up use of statistics. One example was around redefining ‘place of residence’ and ‘place of work’, given that these are now often the same place. She suggested using cellphone data to investigate relevant patterns. I asked about those who don’t have such devices, or are unwilling to give away personal location data. The answer seemed to be ‘big data has solved/will solve that’. Strikes me as utter nonsense: if data is missing, data is missing! And no amount of inference make up for unknown unknowns. Or am I missing something? Zuiderwijk, A., & Janssen, M. (2014, June). The negative effects of open government data-investigating the dark side of open data. In Proceedings of the 15th Annual International Conference on Digital Government Research (pp. 147-152). ACM. Reports and research appears to assume that the benefits of open data dominate open data’s negative consequences. Moreover, much of the existing research discusses benefits and disadvantages on a high level without providing much detailed insight in the underlying processes. Yet many governments are reluctant to open their data, as they are afraid of possible negative consequences of opening data. The objective of this policy paper is to better understand the aspects of the dark side of open data and contributes to the literature by providing a more realistic perspective on open data. We conducted nineteen in depth interviews with public sector officials and data archivists and identified sixteen categories of negative effects. For the dark side inherent to open data efforts the research suggests that a context and dataset dependent decision-making model needs to be made weighing the benefits of open data on the one hand (e.g. creating transparency, the possibility to strengthen economic growth), and the risks and disadvantages of open data (e.g. violating privacy and possible misuse and misinterpretation of data) on the other hand. So I looked at Anneke Zuiderwijk’s publications on Google Scholar. Even though over half are not **immediatel** accessible, I’ve still ended up with 32 PDFs to read, included proceedings from CeDEM 2012 onwards. Watch this space – but don’t hold your breath!